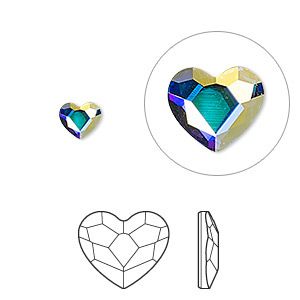 Flat back, Swarovski® crystal hotfix rhinestone, crystal AB, foil back, 10mm faceted heart (2808HF). Sold per pkg of 2. Item Number: H20-A3411CY Have a question about this item? 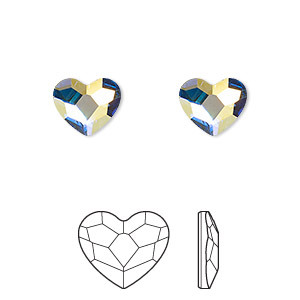 Captivating hotfix heart flat backs are a declaration of love to Swarovski® crystal customers and extend the range of romantic silhouettes with a classic heart shape featuring a soft, delicate cut. 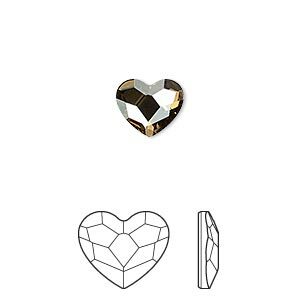 The heart shape is an essential part of romantic, playful, and young looks and a timeless component in jewelry, accessories, and fashion--from lingerie to bridal wear. The heart is a universal symbol of love and completely new to the flat backs product assortment. Color of foil backing may vary. The adhesive is clear. 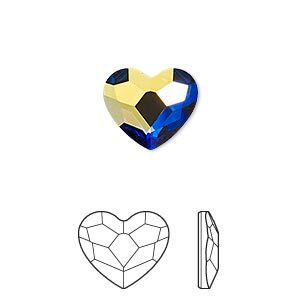 Flat back, Swarovski® crystal hotfix rhinestone, crystal AB, foil back, 10mm faceted heart (2808HF). Sold per pkg of 24. 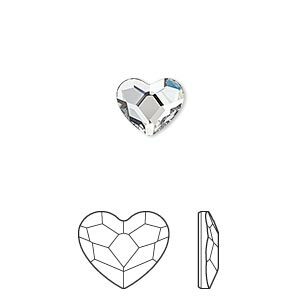 Flat back, Swarovski® crystal hotfix rhinestone, crystal AB, foil back, 10mm faceted heart (2808HF). Sold per pkg of 144 (1 gross).